Today's post is a double yippie kind of post. This months SRC assignment took me to Sarah's blog, Things I Make (for Dinner). Sarah is from Ontario, Canada and loves cooking, travel, baking and trying new things. I do too. We have another thing in common - we both enjoy a good nap .... good to know (I thought I was the only one). Sarah and her husband J enjoy comfort food just like my husband and I do, so when I saw her recipe for Twice Baked Potatoes I knew I found the recipe I wanted to try. Choosing just this one recipe wasn't easy. I can't wait to try her Buffalo Chicken Wontons, Chicken Taco Calzones and every single sandwich she has listed on her site; there are some super yummy options. Back to the Twice Baked Potatoes. Its just what the name suggests - potatoes that are baked twice and has a few special add-ins to make everything taste even more incredible. It has a little back, a little spring onions and a little cheese in the mix, and honestly, how can you go wrong with an ingredient list like that. I knew I was onto a delicious recipe and I wasn't wrong. I love potatoes in any form, but I haven't tried potatoes in this form before. They look adorable and would make a lovely addition to a family meal table alongside a nice Sunday roast. Heat the oil and fry the bacon till it has lightly browned. Add the spring onions and cook till the onions have softened. Cut the potato in half lengthwise and carefully scoop out the flesh, keeping the skin and a little layer of potato under it intact. Add the scooped out flesh to a bowl and put in the bacon and onion mix. Add the sour cream and cheese and mix well. Taste and add salt if needed. Carefully spoon the mix back into the potato halves. Place the stuffed potatoes under the broiler to lightly brown off. Yum! I haven't made these in forever, and they're *so good*. Glad you enjoyed them too! I haven't had twice baked potatoes in ages. They look so good! Thanks Anna ... they were yum! Congratulations on your blogging milestone Trisha. 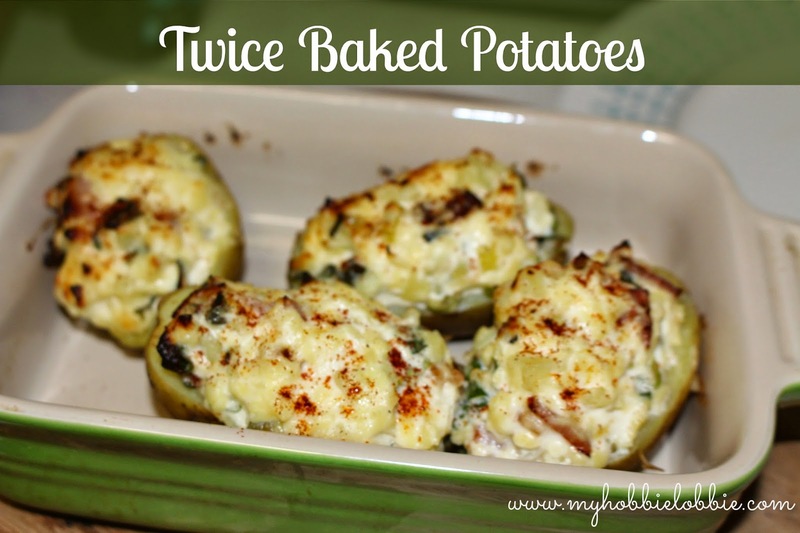 I love twice baked potatoes, and if you add a few more ingredients they are a one dish meal. Thanks .... i'd love to see your version. Twice baked potatoes as a one dish meal - you can count me in! One of my favorite ways to eat potatoes - delish!